Biodiesel has become a buzzword among advocates of petroleum fuel alternatives – but did you know the original “biofuel” was peanut oil? 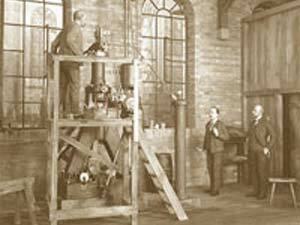 German engineer Rudolf Diesel (1858-1913) built his first diesel engine in 1892. He experimented at first with a number of fuel sources including coal dust suspended in water however by the 1900 World’s Fair in Paris, Dr Diesel had his engine running on 100 per cent peanut oil! Dr Diesel was a strong advocate for using vegetable oils to power his compression ignition motor. Dr Diesel died in controversial circumstances in 1913 just before the outbreak of World War I (he disappeared off the side of the SS Dresden on his way to England where it was rumoured he could be taking his new engine for development – equally he may have deliberately jumped overboard as he was allegedly in financial trouble back home in Germany). His engine was soon modified to run on the oil refinery product we now know as “diesel” and put into use all over the world.